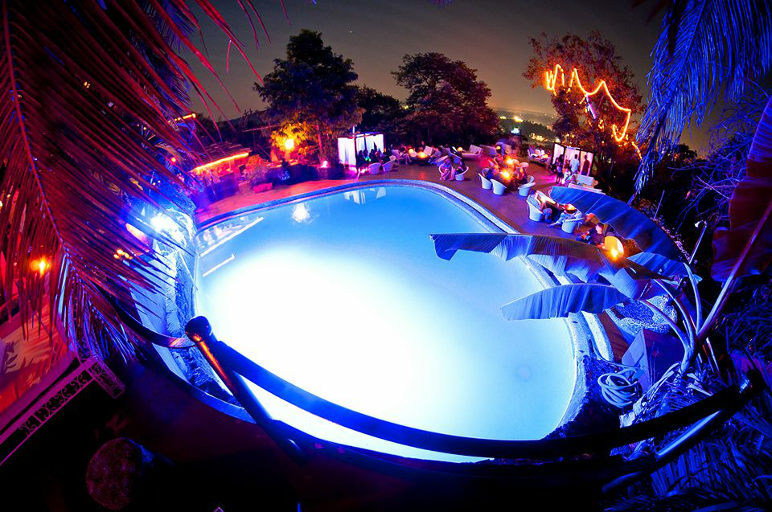 Club Cubana is set amongst the lush green hills just off the main Anjuna – Arpora road. High on the hill, it offers a a free valet parking and shuttle service to the entry of the aptly dubbed “party in the sky”, where patrons are greeted with a hand painted ultraviolet backdrop of the 12 Zodiac signs. Mirrors, along with kerosine Tikki torches and fifty large candles spread across the outer terraces of the club provides an ambience that warms guests to their natural surrounds against the dashes of tiger print and beach chic white leather couches, loungers and cabanas that exude elegance. Purple and red lighting, all eco friendly, create a soothing ambience amidst coconut trees and plants, whilst steps, ledges and pillars are lined with paint that glows from the UV lights that blanket Club Cubana. Club Cubana boasts a swimming pool and jaccuzzi, open all night, with dedicated lifeguards for patrons peace of mind and safety. Open air bathrooms maintain hygiene standards with dedicated staff and sensor taps preventing wastage. 3 fully stocked open bars managed by choice bartenders ensures rapid service. The club serves premium Indian Made Foreign Liquor throughout the night in both the VIP area and the main spaces. Cocktails, Champagne and a wide array of imported drinks are available at an additional charge. A wood fired pizza oven, barbecue grill, and kitchen that was once the families cooking space, maintain the club’s high level of quality providing both veg and non-veg starters and snacks. A family home turned house party, Club Cubana attracts an eclectic array of local and international patrons of all ages, including discerning party lovers from Russia, England Germany, South Africa, Korea, Iran, and Mexico. From dance to commercial, four adaptive resident DJ’s play a variety of music genres including House, Deep-House R&B & hip hop, to please the variety of patrons seeking a “house party vibe” in a safe and comfortable environment. Fire shows and a large fire fountain, sporadically ignite to inject a burst of energy into an already buzzing atmosphere. The inside dance floor, the families home, is lined with a wood framed gallery that leads outside overlooking the club and it’s mesmerising view. In the adjacent room, the family dining room table plays stage to guests who feel the need to dance. Woman are free to dance all night in an area strictly reserved for ladies only. An intelligent fresh air ventilation system sustains equilibrium of temperature inside and outside, and maintains the clubs eco-friendly approach.